2016 Bram Stoker Awards Preliminary Ballot list. 1 March 2016: took part in St David's Day Bookfest, hosting the online event for part of the evening. October 2017: Lost Solace published. August 2017: new edition of Cold Fusion 2000 published. August 2017: Audiobook versions of They Move Below and Turner are published. November 2016: Three of my poems were included in the collection Even In My Dreams. October 2016: Audiobook version of Harvest Festival is published. 25 May 2016: They Move Below published. 2 April 2016: Harvest Festival (novella) published. February 2018: They Move Below got to #1 in some of the Amazon charts, and an Amazon Best Seller label. 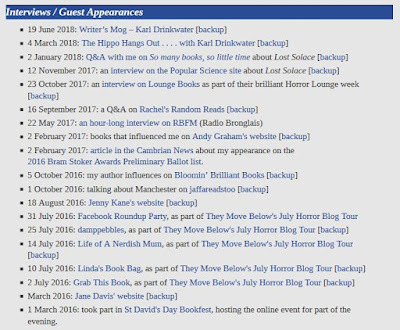 December 2017: Karl Drinkwater’s Horror Collection was one of Altered Instinct's top five books of 2017. November 2017: Lost Solace got to #3 in one of the Amazon sci-fi charts. November 2017: the cover of Lost Solace was awarded a gold star in the E-book Cover Design Awards. 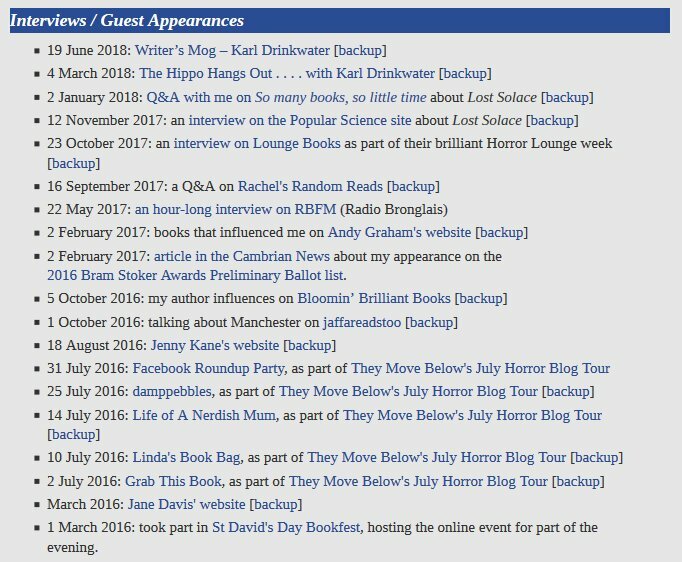 October 2017: Karl was accepted as a professional member of the Horror Writers Association. September 2017: Turner was featured in The Corpse Bride’s Recommended Reads for Halloween. August 2017: Karl Drinkwater’s Horror Collection got to #1 in one of the Amazon horror charts, selling over 1,500 copies in a week. March 2017: They Move Below was a Red Ribbon winner in the Wishing Shelf Awards. 20 January 2017: The 2016 Bram Stoker Awards Preliminary Ballot was announced by the Horror Writers Association (HWA), and included Harvest Festival! 22 December 2016: They Move Below was featured on Nerdish Mum's excellent 12 Books Of Christmas list. 7 October 2016: Harvest Festival was featured in 5 Halloween Reads To Make You Shiver (on Jera's Jamboree). 28 June 2016: IngramSpark entered They Move Below into the British Book Design and Production Awards.